One of the best parts of a holiday break is all the quality time we’re spending with Maximus. Nothing turns my insides to mush more than watching my handsome husband cuddling our little dude. A lot can be said about the comfort of a warm, strong daddy shoulder. The way he knows just how to hold you. The way he rests his cheek on your head. The spot of the should that your chin fits into perfectly. The way your arm fits around his just so. There’s nothing better than falling asleep on your daddy’s shoulder. For years to come, this picture will bond the two together. Maximus with his guitar stalking hat and Bryan holding his son close. My hope is that this innocence lasts for years to come. This relying on another. Trusting and falling into the arms of your mommy or daddy. This innocence that only a child can have. That’s just too precious for words. 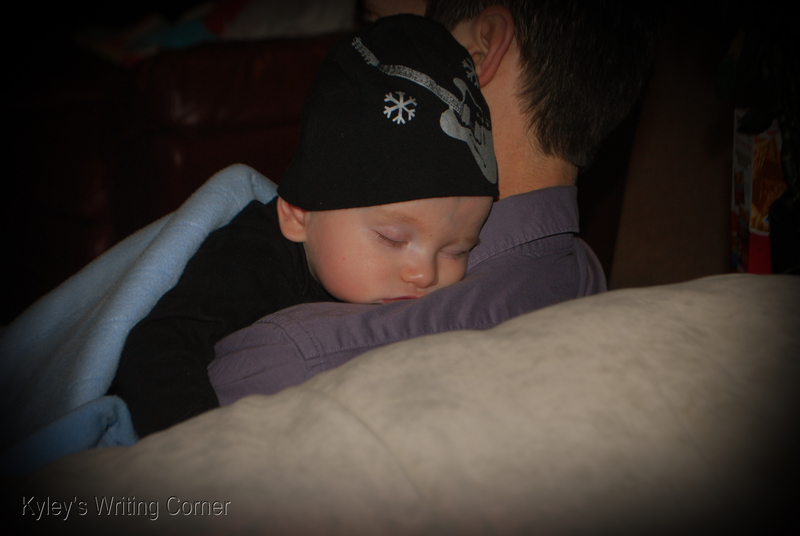 I love the little hat, and daddy snuggles are the best! And yes, I have that same hope for my girls, that they always feel they have a safe place in mama or daddy’s arms. There is nothing like being the one to soothe and make everything okay again. My heart melts just as much when he calms down the minute he’s in my arms. I love that I’m his safety net. He’s just started putting his arms around my neck and pulling me close. I love it!